They deliver much-needed water but big ones can be destructive. An atmospheric river is a long, narrow band of moist air streaming up from the tropics across the ocean drenching the coast. 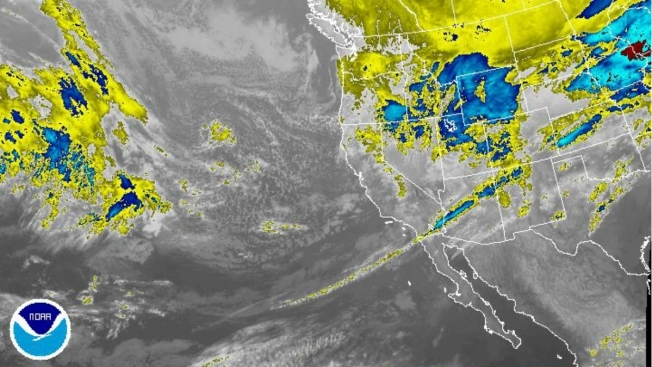 California is no stranger to atmospheric rivers. In fact, one nearly wiped out Sacramento in Gold Rush times. Scientists say climate change will mean bigger and more frequent atmospheric river events that dump more water on the state. In a Scientific American article from 2013, Berkeley paleo-climatologist Lynn Ingram explained that "mega storms" are common, occuring about every 200 years. In 1861 in Sacramento, it started raining on Christmas and didn't stop until 43 days later. The booming city -- its railways, telegraph poles and buildings -- were suberged under 10 feet of water. The brand new state legislature had to up stakes and move to San Francisco for 6 months. Many people and cattle died. The San Francisco Bay, usually full of salt water from the ocean, filled with fresh water and aquatic life suffered. The Central Valley was flooded from what is now Modesto to Chico. It was an extreme version of the "pineapple express" storms that California gets every year at least half a dozen times, Ingram said. That particlar storm was so bad because it lingered. Climatologists only recently identified the phenomena of atmospheric rivers using satellite technology that can visualize the water vapor in the atmosphere, Ingram said. Her research explores the history of these storms going back thousands of years before recorded history. By digging cores of sediment from under the San Francisco Bay, lakes and marshes, Ingram can analyze chemistry, fossils and composition to make guesses about the weather hundreds of years ago. Atmospheric rivers hit California every winter and are responsible for at least a third of the state's water supply. Ingram saw evidence of mega-floods every 200 years or so. With climate change, Ingram expects these warm storms to come more frequently, linger longer and deliver more tropical moisture to the West Coast in the future. More heat in the atmosphere means more energy in the tropics, which occasionally needs an escape valve and spurts across the Pacific to California. In the Central Valley, what was once open range and wilderness in 1861 is now subdivisions and productive farmland, home to 6 million people. With more groundwater pumping because of the drought, the land has sunk further. Ingram said officials need to be aware of the risk, and think carefully before they build infrastructure and permit subdivisions.